Welding goggles shade 14, 13, 11 and 5 protect your eyes from harmful UV and IR light. 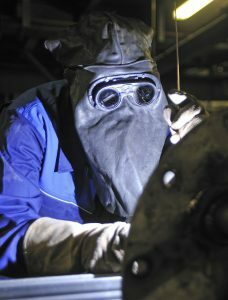 Metal workers wear safety welding goggles for welding, grinding and cutting. 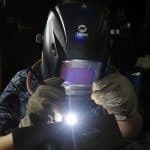 Below you will find my top list of welding glasses in 2019. And after that, I will show you which welding goggles are safe for which application. High-intensity UV and IR light can damage your eyes, so make sure to wear the right eye protection. What welding goggles shade level for which application? Welding goggles with shade #14 are very rare, but Titus offers these industrial steampunk style safety welding goggles. These welding goggles are CE certified, ANSI Z87.1 certified and EN175 compliant. For a good fit, you can adjust the head strap and the nose bridge. The shown welding goggles set includes interchangeable welding lenses with shade #14, #11 and #9. Thus you can use the safety goggles for torch soldering, plasma cutting, grinding or MIG welding. The additional protective case protects your goggles from any damage during transportation. This auto-darkening goggles from Miller Electric allow you to weld in areas with limited space for conventional welding helmets. The goggles are ANSI Z87.1 certified and come with adjustable shades. 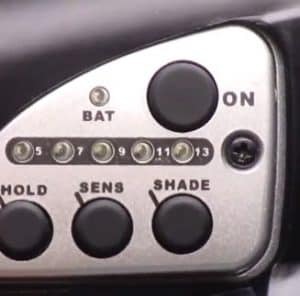 Choose between #5, #7, #9, #11 and shade 13. Thus the goggles can be used for oxy-acetylene welding and cutting, TIG, stick, MIG welding and grinding. These goggles are ideal if you have to switch shades regularly. Shade #3 is used for clear vision between welds. 2 sensors provide a switching speed of 1/15000 s. According to the manufacturer, these goggles provide a battery life (CR2032 cells) of up to 1,000 hours. The weld-mask fits under hard hats without adapters. On the downside, auto-darkening welding goggles are much more expensive than passive goggles. The Servore ARC-513 is an ergonomically designed auto-darkening welding goggle. Auto-darkening welding goggles are very rare on the market, so the ARC-513 is probably the market leader. The shade level can be adjusted to five different levels from #5 up to shade 13 depending on your weld job. When inactivated they have shade #4. In fixed shade mode you can set them to shade #5 and #7. In auto-darkening mode shades #5, 7, 9 and 13 are available. Although these are auto-darkening goggles that daetect the welding arc and darkens the lenses, you need to use the power button to switch the device on. 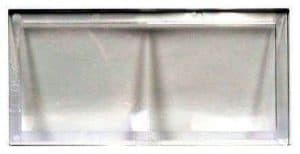 Prescription lenses can be mounted in the included frame for additional convenience. The goggles are designed to minimize fogging. Also read: Top custom and cool welding helmets. Again, these are an excellent pair of goggles but since they come with the sophisticated auto-darkening technology they are pretty expensive. The color of the product will be sent by random. Goggle products do not come with auto power on function. This button is to turn on the power. Shade level can be adjusted in 5 levels from #5 to #13 according to welding type and current. These Titus shade #11 welding goggles provide removable green tinted shade #11 glass lenses. They are some real piece of safety equipment because they even exceed ANSI Z87.1 & Z80.3 standards. Usually, people use these for torch soldering, grinding and welding with medium power. Thanks to the fully adjustable strap you can make sure the goggles always sit comfortably. The frame is scratch and impact resistant. According to various lens shade guides a shade #5 lens should only be used for torch brazing, torch soldering and plasma cutting up to 40 amps. To avoid flash burns, I’d suggest to go for darker lenses when welding. These Jackson safety glasses with green shade #5 lens meet ANSI Z87.1+ impact standard and are CE compliant. They provide an UV protection of 99.9%. A plus for them is that they will fit over prescription glasses. Overall they are well designed and give you a sporty look. These Hobart safety glasses have a stylish, functional and ergonomic frame. The mirrored shade 5 lenses are made of shock proof polycarbonate. Moreover, the lenses are coated with a scratch-resistant coating. The Hobart 770726 goggles meet ANSI Z87.1 standards and have a UV400 rating. On the downside, please keep in mind that the Hobart goggles not large enough to fit over prescription eyeglasses because they fit rather tightly. Miller Electrics shade 5 welding goggles have a frame and green lenses made of polycarbonate. These comfortable and great looking glasses meet ANSI Z87.1 standards and provide UV protection of 99.9%. The Miller glasses are an excellent choice for low amp plasma cutting. They will very likely not fit over prescription glasses. Founded back in 1932, Forney is a well-known manufacturer of excellent welding-equipment. The Forney 55320 shade #5 goggles are designed for gas welding and plasma cutting only. You can lift the front with the No.5 shade and you can see through the clear glass which is behind. The lenses are additionally hardened to ensure a long lifetime. On the downside, some people have reported they could not use the glasses for all welding angles. 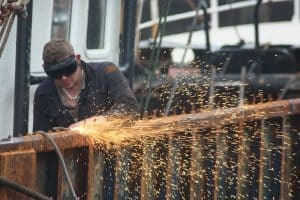 What are welding goggles and how do they protect the eyes? Dark safety goggles for welding provide protection against UV, IR waves and the bright arc light. Choose between passive welding googles and auto-darkening welding goggles. You can also use your welding goggles for cutting and grinding. Now, how dark are welding goggles? Typical arc welding helmets come in a range of shades from #9 to #14, where shade #14 is the darkest you can get. Welding goggles for arc welding, plasma cutting, torch cutting, plasma welding, MIG welding and TIG welding require a shade level of up to shade #13. A thing a lot of people do not know is, that all well-designed welding lenses filter out almost 100% of the UV and IR waves. In contrast, the shade rating just tells, how dark the glasses make your sight. Moreover, it also depends on your amps how bright the welding arc is and what shade you need. Check out the overview from Lincoln Electric here which shows the correlation between amperage and weld process. As a general rule, you should start with a shade that is too dark to see the weld area. Then try out lighter shades until you have sufficient view of the weld zone. Welders glasses do only protect your eyes. You should make sure to wear additional safety clothing like welding masks, welding jackets, welding trousers or welding gloves. If you do not protect your skin, it can lead to welding sunburn. Shade 5 is the darkest lens in safety glasses before you need additional skin protection to avoid burned skin. If you need high shade lenses, you must wear an additional full face mask, because your face will need extra protection. 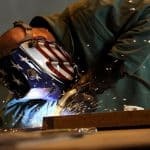 A good alternative for welding goggles and glasses are welding helmets, which cover your whole face. Which features should I look at before buying? First of all, you should determine your required shade levels. Then you need to decide if you want auto-darkening functionality. Moreover, some safety glasses provide dust protection through rubber or foam that sits tight on your face. Also helpful is an additional anti-fog coating that avoids fog on your glasses. If you wear prescription glasses, you need to make sure that you can wear them under your welding glasses. Maybe you can add a magnifying cheater lens. Which welding goggle is suited for a solar eclipse? Because welding goggles give an excellent shade, some people wear welding glasses also for a solar eclipse. According to the NASA article here, you should choose glasses with at least a shade 12 filter to look at the sun. So what are the best welding goggles with shades #12, #13 and #14? As mentioned, welding goggles require an additional face mask. If you prefer a complete face cover, you might be interested in auto-darkening welding helmets and welding masks. Besides the goggles you can get at home depot, harbor freight and Lowe the ones we show here are a real alternative. Finally, you have to choose goggles with a shade level that fit the scope of your work. Moreover, you have to decide if you can afford the higher price for the additional auto-darkening functionality. Last but not least, you should take a comfortable fit and a good looking design into account when making your decision. For welders, I think that the Titus shade #14 welding goggles with interchangeable lenses provide a good price/performance ratio. If you do plasma cutting and torch soldering only, I’d personally go with the Jackson shade #5 glasses which are listed above. Hi, I’m a writer and I can’t find any information about welder’s goggles from before the invention of the mask in the 1940s. If the welding exists since 1800, were the welders wearing nothing, not even some kind of sunglasses or snow goggles, as Victorian glacier climbers and ski enthusiasts did? The spark is quite bright and I can’t imagine them building the Eiffel towed with naked eyes 😉 Please let me know if there were ANY kinds of goggles or protective glasses involved before the invention of the welder’s mask. Thank you. this is an interesting question. I guess there had been some kind of protective glasses. At least they could have used glass blackened with soot. 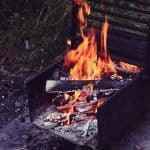 But this is only assumption, I can not really tell and after a short recherche I did also not find out how it was done in the past before welding goggles were invented. Maybe one of our readers knows?